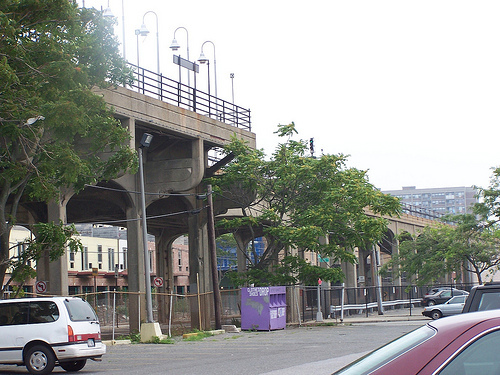 The Rockaway Line is certainly not what most people think of when the New York City Subway is mentioned. A former steam railway dating to the 1890’s, this neck of the NYC Subway’s A Route serves, Broad Channel, which could pass for a New England fishing village, and gives amazing views of the Jamaica Bay Wildlife Refuge which it crosses on its way to the Rockaway Peninsula, where the elevated stretch between Mott Avenue and Rockaway Park provides riders with a panoramic view of the Atlantic Ocean. As a child I could see the and hear the line from the rear window of my old home in Arverne, and I would always stop whatever I was doing to see the trains go by. 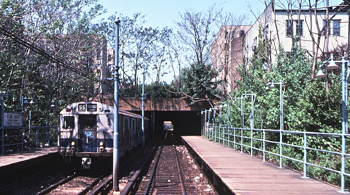 The Rockaway Line was our way in and out of Manhattan and we used it frequently. I remember looking out at the World Trade Center as we were crossing the trestle over Jamaica Bay and thinking how amazing it was that I could look out at the twin towers on the horizon and then be almost right underneath them when the train reached Chamber’s Street a short while later. I would listen to stories from my great aunt who would tell me of when the line was operated by the Long Island Rail Road prior to the 50's, and I was lucky enough to live downstairs from a cousin who worked as a motorman on the Subway and would tell me about the famous “redbird” trains that were stationed at Rockaway Park in the very early 1990’s that I was too young to remember. The Rockaway Line was my railway growing up, I miss being able to ride it now that I’ve moved away, but I still enjoy visiting the area and seeing the trains go by. Train enters Gaston Avenue Station as seen from the rear window of my old home in Arverne. As I learned more about the history of the Rockaways in recent years I was able to put together an idea of what the Rockaways were like when the community and its railroad were young and what it might have looked like today had history gone a bit differently. In the last year or two I’ve had a few dreams about the Rockaways in which the subway line took different routes, the streetcars were still around, neighborhoods were arranged differently, and other variations. Most recently I dreamed up a universe where trains were operated by a company called the Arverne and Canarsie Railway, which combined with all the previous dreams made for a fairly complete alternate history that I thought deserved to be shared, so here it is. 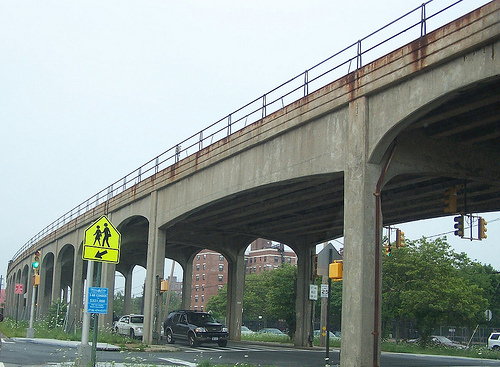 The Arverne and Canarsie Railway follows the A Line of our world’s New York City Subway from the Rockaway Peninsula across Jamaica Bay and then turns west after Aqueduct Racetrack on to Rockaway Boulevard. Where as the A Line in our world dives underground at Grant Avenue and becomes a proper subway, the route on the ACR continues westbound as an elevated railway, shadowing the A Line until curving south onto Atlantic Avenue and following the Canarsie Line (the L line on the NYC Subway) which is elevated up until Rockaway Parkway, where it continues at grade level to the terminus at Canarsie Pier. 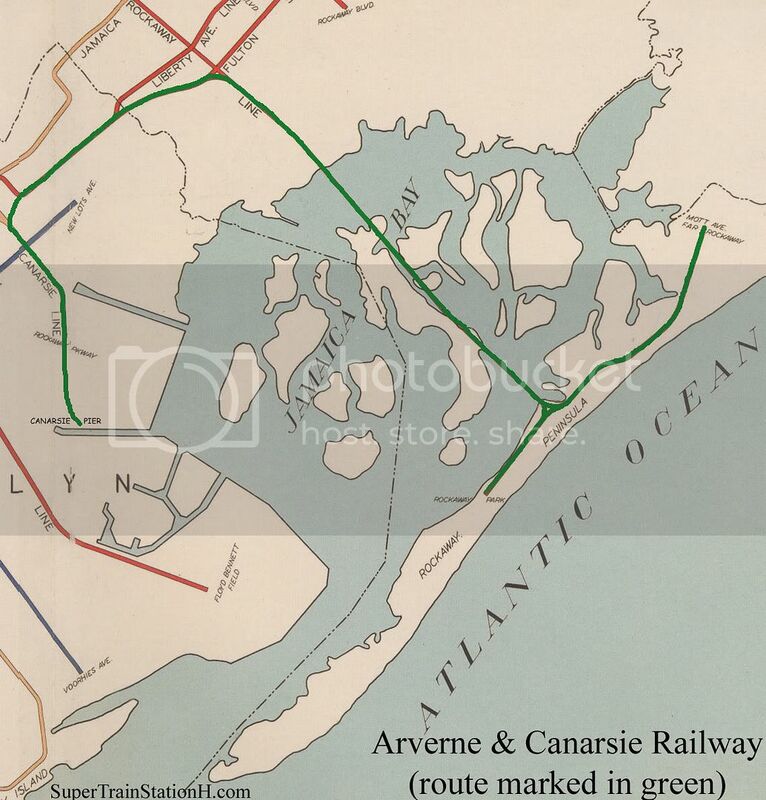 I knew very little about the Canarsie Line until doing research in preparation for this feature, and it turns out that the Canarsie Line, like the Rockaway Line, was formerly a steam railroad, which is unusual as New York’s subway lines were electrified from the very beginning and generally have no history of steam traction. The world of the Arverne and Canarsie Railway is slightly less urbanized and a bit more forest-like than what we see on the A and L subway lines of our world. The stations on the ACR are kept as green and garden-like as possible, not unlike this old scene from the NYC Subway’s Franklin Avenue Shuttle. 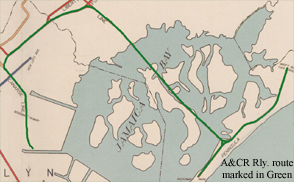 The Arverne & Canarsie Railway opened in 1895 as a steam operated surface and elevated line. By 1910 the line was electrified with overhead trolley wire to allow access to electric street railways, mainly the Ocean Electric Railway of the Rockaway Peninsula. The ACR itself would also use trolley cars on its right of way. 1920 saw the arrival of steeplecab electric locomotives that became the preferred locomotives for pulling passenger trains. All non-streetcar services were locomotive hauled until the 1940 arrival of multiple-unit trains similar to the Bluebird Compartment Subway Cars used by the BMT. The remaining steam locomotives were withdrawn from regular service in 1950, and the compartment cars then became the preferred stock for passenger service, with the steeplecab locomotives generally being used for maintenance and freight duties, hauling revenue trains only when necessary, or for special trips. Trains nearly identical to the R-36 Subway cars were purchased in 1968. The Ocean Electric Railway adopted PCC trolley cars in the 1960’s which operate on the ACR’s right of way on the Rockaway Peninsula and to Howard Beach. The ACR itself also owns several PCC cars for use near Canarsie Pier. In its steam days the Arverne and Canarsie operated ten identical steam locomotives similar to this example. Like all Arverne and Canarsie rolling stock these engines carried a green livery. Steam was retired from regular service in 1950, though two steam locomotives were preserved and are used on special excursion trains that run on certian weekends in the spring and summer. They also come in handy for saving stranded trains in the case of power outages. 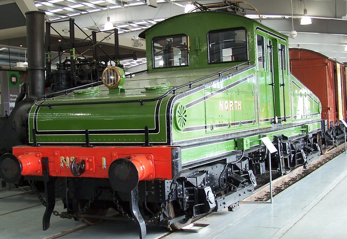 These are electric steeplecab locomotives of similar shape and color to this example. They were used to haul unpowered passenger stock when introduced in 1920 and continued to do so until motorized compartment cars became available in 1940. These locomotives are still used for works and maintenance trains, and sometimes are called upon to haul failed revenue trains. Special excursion trains pulled by these locomotives also run on certain weekends in the spring and summer. A real-life fan excursion with a similar locomotive and train at Far Rockaway station produced this scene, not unlike one that might be seen on the Arverne and Canarsie. A diverse selection of streetcars from numerous street railways have run on Arverne and Canarsie metals, but today the ACR shares its right of way only with the Ocean Electric Railway, which runs services up and down the Rockaway Peninsula and through to Howard Beach with PCC trolley cars in addition to its street operations in the Peninsula area. The ACR itself also owns several PCC cars which are used between at Canarsie Pier to shuttle people arriving by boat to their “big train” waiting at Rockaway Park. 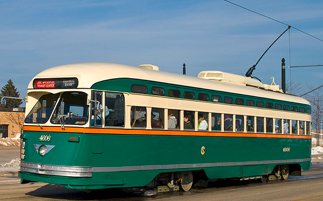 The Ocean Electric’s PCC cars are painted white with a green stripe below the windows, while the Arverne and Canarsie’s trolleys are the traditional all-over green. 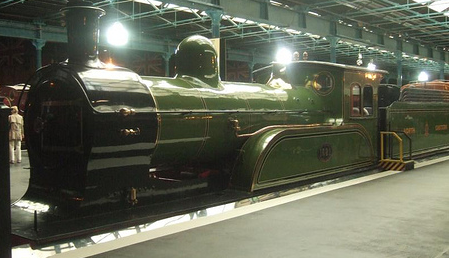 Introduced in 1940, these are similar to the Bluebird Compartment Cars ordered by the BMT, as can be seen here, though of course painted in ACR green. The Compartment Cars were designed to utilize similar features to PCC trolley cars, and like all Arverne and Canarsie electric stock these were powered via overhead trolley wire rather than third rail. The arrival of the Compartment Cars brought about the end of locomotive hauled revenue trains on the ACR. Built in 1968, these are the newest trains on the Arverne & Canarsie Railway. They are near carbon copies of the R-36 World's Fair Cars of the New York City Subway, but feature trolley poles for electrification and are painted green, like this example. The R-36 type cars along with the Compartment Cars make up the current revenue fleet of the Arverne and Canarsie Railway. Two trains of seven unpowered Arverne and Canarsie coaches have been preserved for use on locomotive hauled excursion trains, and can be pulled by steam or electric. When pulled by one of the surviving steam locomotives, they form the oldest complete train in the United States. The coaches are similar to old elevated cars like these. The day after I dreamed up the Arverne & Canarsie Railway I was given an unexpected excuse to pay the area a visit, and was able to get some photographs of the Arverne & Canarsie's real world counterpart. A stretch of the former Long Island Rail Road line the between Edgemere and Frank Avenue stations on the Rockaway Peninsula as we head west toward my old neighborhood of Arverne. In real life this line was run by the Long Island Rail Road until the 1950's when it was abandoned by the LIRR and absorbed into the IND Subway system. These stations still carry their old names on the signs, but are now officially refered to by their street number names, though on the Arverne & Canarsie Railway the old names reign supreme. Here is the Beach 67th Street station in Arverne, always known to me by its old name of Gaston Avenue. This was my station growing up, and it marked the beginning and end of every outing into Brooklyn and Manhattan. My interest in this line's history probably began when I asked my mother where Gaston Avenue was located, and Mom couldn't give me an answer since Gaston Avenue no longer exists, complicated by the fact that the station was relocated twice in its history. This station dates back to 1888 and was one of the stations along this line that connected with the Ocean Electric Railway. 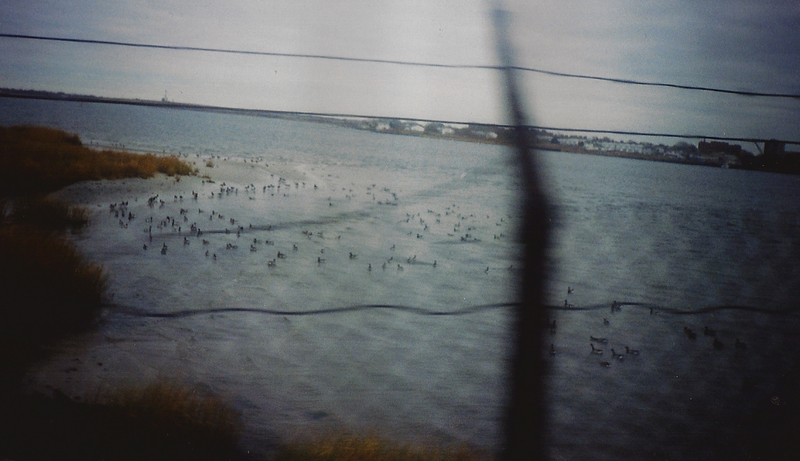 A Trains leaving from Gaston swoop north toward Jamaica Bay and Broad Channel. Here is a photo of some nice old Brooklyn Union Elevated cars running just beyond this station down Hammel's Wye on a fan excursion. This is the station at Beach 105th Street, also known as Seaside. I've never used this station before in my life. According to Wikiepdia this is the second least patronized station in the entire NYC Subway system. Both Gaston and Seaside were undergoing rennovations when I was there in late July of 2009. I took video of a train leaving the station which can be seen HERE. A photograph of Jamaica Bay from a moving train in 2000. 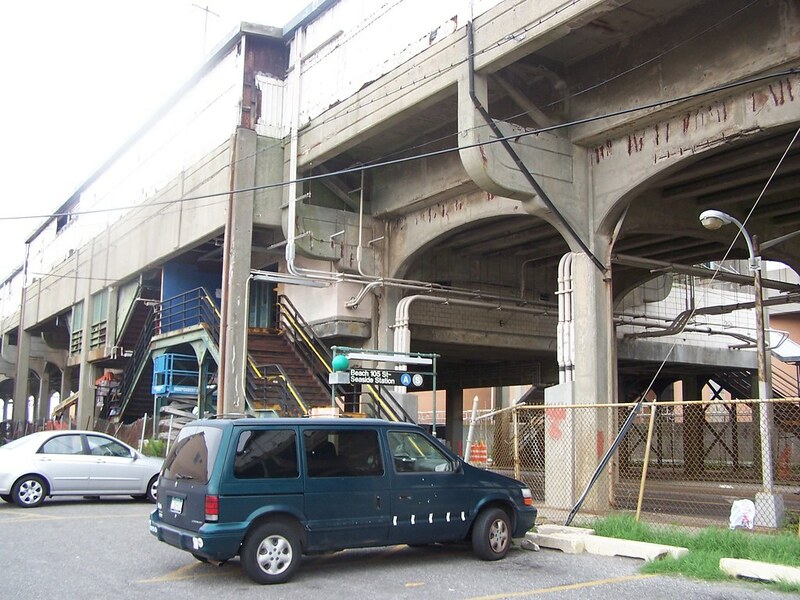 This is not from the Rockaways, it was actually from the Flushing Line in 2000 or 2001. 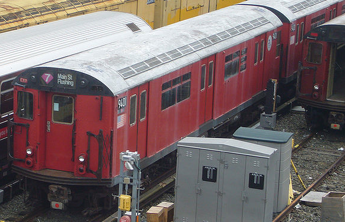 These are the R-36 Subway Cars in their famous "redbird" livery, the last trains on the system to wear coats of paint. They were retired in 2003. The redbirds were actually stationed at Rockaway Park Yard in the late 80's and early 90's just as they would have been on the Arverne & Canarsie, but I never had a chance to see or ride on them then since they didn't run through to Gaston. This 1991 photograph taken at Rockaway Park could be a scene straight from the Arverne & Canarsie Railway if the cars were to have been painted green like this example, also taken at Rockaway Park. Special thanks to those who have made their materials available for use by releasing them into the public domain or under a Creative Commons license.